Product / Goods Details: VTech Machine,Double column.4200 Size. Relocation Services has become a new trend in the Delhi Capital Region areas due to the maximum numbers of corporate and companies. Every working professional wants to reside near to the office to avoid the daily traveling of a long distance. Our firm has made incredible breakthrough in providing Generator Shifting Service. Accredited for its suppleness and reliability, these services are mostly demanded. More to this, we provide these to our clients after understanding their budgetary prerequisites. We M/s. Jagruti Technical Services Pvt. Ltd. is a Company for providing Turnkey Project Services of Industrial Plants / Machines Lifting, Shifting, Installation & Commissioning, since 2006. Since then We are working successfully with our clients, without any complaint. If you own an elaborate industry and want it to be moved with yourself, you are sure to find all help required with us. Our trained staff and personnel take care to handle all machineries that are to be moved. We are specialist in moving heavy machineries accros India. We offer packing and moving for industries. 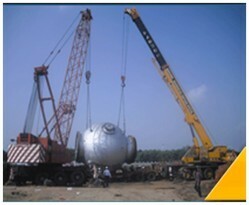 We are safely transport the industrial goods and machines to the destination. Whole packing is complete with too much care, because your precious goods are valuable for us. - Our offered Machinery Shifting Service is widely demanded in production based industry. Our employees are hard working and offer complete satisfaction to the customers by shifting all machinery in safe mode. We charge affordable price for shifting. Experienced drivers do safe transportation. Riding on high capacities of industrial ability and understanding, we are providing top class Plant Machinery Shifting Service. These services are delivered in agreement with the clients’ requisites to achieve client gratification. In addition, we commence these services only after identifying the given details of our clients.